Citation: MacLeod, S.J., Williams, S.E., Matthews, K.J., Müller, R.D. and Qin, X., 2017. A global review and digital database of large-scale extinct spreading centers. Geosphere, pp.GES01379-1. Extinct mid-ocean ridges record past plate boundary reorganizations, and identifying their locations is crucial to developing a better understanding of the drivers of plate tectonics and oceanic crustal accretion. Frequently, extinct ridges cannot be easily identified within existing geophysical datasets and there are many controversial examples that are poorly constrained. We analyze the axial morphology and gravity signal of 29 well-constrained, global, large-scale extinct ridges that are digitized from global datasets, to describe their key characteristics. Additionally, the characteristics of a representative collection of active spreading centres are analyzed to review the present-day variation in the bathymetry and gravity signal of ridges in different tectonic settings such as back-arc basins, microplate ridges and large-scale plate boundaries with varied spreading rates. Uncertain extinct ridge-like structures are evaluated in comparison with the signals of well-defined extinct ridges and we assess whether their morphology and gravity signals are within the range seen at extinct (or active) ridges. There is significant variability in extinct ridge morphology, yet we find that the majority of well-defined extinct ridges have a trough form and a negative free-air gravity anomaly. We compile available data on the spreading characteristics of extinct ridges prior to cessation, such as their spreading rates and duration of spreading, and find significant differences between ridge subtypes and between oceans. Large-scale extinct mid-ocean ridges persist much longer than extinct microplate spreading ridges and extinct back-arc basin spreading ridges before cessation. Microplate spreading centres have the highest spreading rates prior to extinction, and have greater relief at their axial segments, suggesting a different crustal accretion style that is likely to be related to the rotation of microplates simultaneous with spreading. Back-arc basin ridges have more pronounced relief when they have been active for longer before cessation, which supports theories of reduced magmatic supply as the basin width increases. 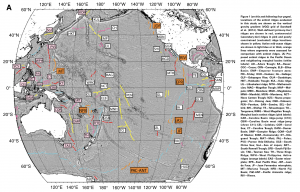 Extinct ridges in the Pacific Ocean had higher spreading rates than in other oceans, and the Pacific has the largest number of extinct ridges and extinct microplates (even accounting for its larger size), reflecting an increased propensity for ridge jumps and propagations with higher spreading rates. Extinct ridges in the Atlantic Ocean have the lowest spreading rates prior to cessation and tend to persist for twice as long as those in the Pacific before extinction. There are a large number of extinct ridges preserved within marginal basins, although many are situated in actively deforming regions. Our review of a large number of controversial extinct ridge locations offers some insight into which proposed locations are more likely to have been former spreading centres and our analysis further leads to the discovery of several previously unidentified structures in the south of the West Philippine Basin that likely represent extinct ridges and a possible extinct ridge in the western South Atlantic.